In a world dominated by iPhone applications and games, Chillingo stands apart from many app developers in that they always leave their customers happy with the final product. As the developers of the highly acclaimed Angry Birds app, Chillingo has recently released Feed Me Oil for the iOS audience. Feed Me Oil is a game that is both visually appealing and challenging to the user and offers the avid iPhone gamer something that few other applications can. The game revolves around the storyline that a large oil pipe has broken and there is crude oil spilling throughout the land. The only way for a clean tomorrow is to feed the oil to large oil-eating beasts. The behemoth monsters will eat all of the oil that comes to them but first the oil must be delivered directly to their mouth due to their inability to move. 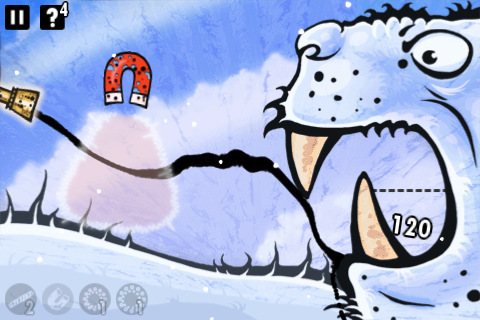 Players are required to utilize a number items such as magnets, pinwheels, and fans in order to get the liquid gold into the mouths of the beasts. The level progression in Feed Me Oil is pretty standard to previous games released by Chillingo. Players complete a group of levels while being awarded stars based on the performance in the level. Bonus levels are acquired through the acquisition of stars. Stars are awarded to players based on the number of gadgets used as opposed to the amount of time that is taken to complete the level. The overall look of the game is clean and apart from repetitive music found within the game, it plays very well. Although the general notion of the game is not totally exclusive, the use of oil in the game is a genuinely new idea and adds a new element to the game. The use of oil instead of water, for instance, adds a different feel to the game because the oil is thicker and stickier than traditionally used water. Besides the desire for more levels, I have very few gripes about Feed Me Oil. The only con that could be found besides the limited number of levels is the occasionally problematic controls. The single qualm with the controls is that there is the occasional tendency to spin an object when it is being dragged or vice versa. Because there is no time element to the game and the position of the item does not matter until the pipeline is engaged, these are very minor issues. It just means that setting up the level takes a little bit longer than desired in some circumstances. 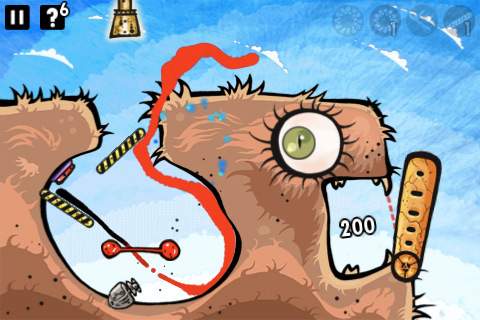 Overall, Feed Me Oil is an interesting iPhone game that adds new elements to an already used game concept. An iPhone app definitely worth investigating, I give Feed Me Oil a rating of 4.5 out of 5. AppSafari review of Feed Me Oil was written by Darius Reimm on June 14th, 2011 and categorized under App Store, Games, Resource Management, Strategy. Page viewed 4171 times, 3 so far today. Need help on using these apps? Please read the Help Page.